Taiwan is a small island country off the southeast coast of mainland China. Also known as Formosa, it is the largest island of the Republic of China (ROC) in East Asia. Taiwan is a very unique combination of cultures, having been ruled by the Dutch, Chinese, Imperial Japanese, postwar China and even, arguably, the United States at different points in history. The culture of Taiwan still bears the marks of these foreign powers. Taiwan is a safe, well developed country, with a rich Chinese cultural history, and ample opportunities to teach English. This program provides a comprehensive blend of training and orientation, pre-departure job assistance, and services to support you while you teach English in Taiwan, helping to ensure that you have a secure, rewarding adventure. The TeachTaiwan Program begins with an intensive TESOL training and Certification phase. The 4-week TESOL training program takes place in Phnom Penh, Cambodia, with two great optional weekend excursions. You will have a chance to meet participants in the other Asian programs, extending your LanguageCorps network and making great contacts for future travel or vacations while you teach English in Taiwan. Once you are accepted into the TeachTaiwan Program, we will start working with you pre-departure to connect you with a position to teach English in Taiwan. At the end of the four-week certification phase, you will travel to your destination city in Taiwan. The training in Cambodia includes 100 hours of in-class training and 20 hours of actual teaching practice with local students. Your classes will be observed by our professional training staff and you will be provided with constructive feedback to improve your teaching style. 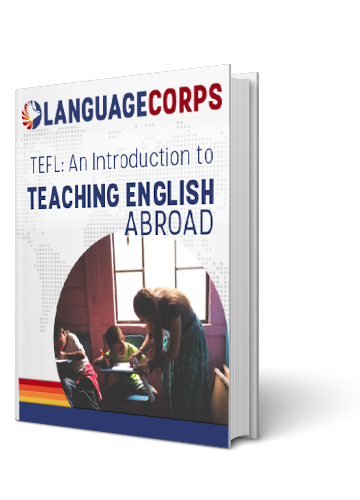 In addition to classroom instruction in effective EFL teaching principles and techniques, you will learn how to plan lessons, conduct effective classroom activities, and implement what you have learned in practice teaching sessions with local EFL students. Course materials are included in the program fee. Accommodations during your 4-week program in Cambodia can be arranged for an additional fee in a nice hotel in the heart of Phnom Penh. All rooms have air-conditioning and western style bathrooms. Accommodations begin the Saturday before your program start date and conclude the morning after the final class. Additional days in Cambodia can be arranged before/after your course for an extra fee. You will be responsible for your own meals. Our recruitment partner and your hiring school will assist you in finding housing in Taiwan. Teaching positions are available throughout Taiwan, but most are in the main cities of Taipei, Kaohsiung, and Taichung. Positions are typically in private language schools, and students are usually children, although you might teach adults as well. Class sizes are usually small, and students are eager to learn and enjoy English! In addition to your time spent in the classroom, you will administer tests, grade papers, and participate in school meetings with your Taiwanese co-teachers. Your salary as an English teacher in Taiwan will be more than enough to live a comfortable lifestyle and save for trips around Taiwan and to other countries in Asia! Language schools in Taiwan hire year-round and 12-month contracts are standard. If you are accepted into the TeachTaiwan Program, we will work to connect you with an in-country position teaching English, with good pay and benefits. Flexibility in terms of start dates, location, and work schedules is required. There may be a short period of time between the end of training and the beginning of your contract to teach English in Taiwan. Most people view this as a great opportunity to fit in a little travel before the job starts! A TEFL, TESOL or CELTA certificate and a 4-year degree are required to teach English in Taiwan. Schools in Taiwan don’t provide housing for you, but you will receive assistance in finding an apartment which matches what you are looking for. The cost of an apartment in Taiwan varies from city to city. In all cases, apartments are much less expensive than what you would expect to pay in most Western countries. Most apartments are spacious and comfortable, and there are many accommodation options depending upon your personal preferences. As the economic and cultural hub of the country, expect to pay a premium for housing in Taipei. Within Taipei City expect to pay NT$10,000/month (approximately US$310) + utilities. As you move out into what is called Taipei County, your costs could fall as low as NT$5,000/month (approximately US$155), but expect an average of NT$7,000-9,000/month (approximately US$215-280) + utilities. The housing situation in the rest of Taiwan is roughly the same throughout, particularly in terms of price. You can expect to pay as little as NT$4,000/month (approximately US$125) and no higher than NT$7,000/month (approximately US$215) + utilities for a simple one bedroom studio. Space is less of an issue, so apartments tend to be a little larger than a similarly priced Taipei apartment. Expect to pay NT$500 to NT$1,000 (US$15-30) a month for basic utilities (water and electricity). There is no central heating in Taiwan because it is not that cold. Most apartments do come with air conditioning which is an absolute must during the summer months, but you will pay a little extra on your electric bill. In Taiwan, just about every apartment is wired with broadband internet connection. Many landlords will include the internet in monthly rent, but if they don’t you should expect to pay an additional NT$500/month (approximately US$15) for internet. Internet cafes are readily available throughout Taiwan. Airfare is typically not provided by employers, but you should be able to save enough money to recoup those costs. With the exception of those who hold passports from Indonesia, Loas, Malaysia, the Philippines, Singapore, Thailand, and Vietnam, you will need to obtain an e-visa online prior to travelling to Cambodia for the TESOL Certification Course. This visa allows you to stay in the country for 30 days and would suffice for the duration of the course. One of our affiliated schools in Taiwan will help you obtain a work visa and provide you with all necessary documentation. Just 180 km east of China, you’ll find the small island country of Taiwan. Its diversity stems from a history of being ruled by the Dutch, Chinese, and Japanese. Today, Taiwan functions as a democracy and autonomous state of the Republic of China (ROC), but you can still see the influence of these foreign powers instilled in the Taiwanese culture. Much of the island is lush forestland, but the topography includes picturesque mountains, rice fields, and balmy beaches. Taiwan enjoys warm weather all year round. The strongest fluctuations in weather conditions are during spring and winter, while the weather is relatively stable during summer and autumn. The annual average temperature is a comfortable 72 degrees Fahrenheit, and with the exception of a few mountain areas where some traces of snow can be found during winter, no snow can be seen throughout Taiwan. Taiwan is a country of contrast, where cutting edge modern conveniences belie the traditional culture which still remains strong today. The official language of Taiwan is Mandarin Chinese and the most popular foreign language in Taiwan is English, which is part of the regular school curriculum. Taiwan is a safe, well developed country, with a rich Chinese cultural history and great opportunities to teach English. Taiwanese culture is a combination of traditional Chinese and Taiwanese culture. More recently, Japanese and Western culture have also been blended into this mix. Due to its great ethnic diversity, Taiwan has a wide variety of cuisines. These include Holo (also called Minnanese, or simply Taiwanese), Hakka, and vegetarian foods, as well as the various cooking styles of mainland China such as Hunan, Jiangzhe (from the provinces of Jiangsu and Zhejiang), Hong Kong (Cantonese), and Sichuan. Virtually every city has its famous specialties; many Taiwanese tourists will go visit other cities on the island only to try the local foods. Your typical Taiwanese meal can be found right on the streets. Little mom and pop stalls are everywhere selling all kinds of snacks and none of it is very expensive. Night markets are a great place to try a number of different foods, and can be found in every town in major cities; in Taipei there are literally dozens! Typically, one can spend as little as NT$200-300 (US$6.00-9.00) per day here and eat well. In Taiwan, people dress in stylish clothes and follow European or American styles. When teaching, women should cover their shoulders (sleeveless shirts are acceptable, but very thin straps or tank tops are not). No low-cut necklines or very short skirts. Open-toed shoes are acceptable. Male Teachers should wear long pants (not jeans), short- or long-sleeved shirts with a collar, and loafers or dress shoes. Long hair should be neatly tied into a ponytail. Three optional excursions are available to TeachTaiwan participants during the Certification Course in Cambodia. You can explore ruins of the largest religious building area in the world, and one of the Seven Wonders of the Ancient World. Temples range in condition from moderately restored to jungle encrusted. The excursion includes time for a visit to a near-by waterfall to cool off, relax, and enjoy. This trip creates memories that will be treasured forever! Another weekend excursion is available- this one to the beautiful beaches of Sihanoukville in Cambodia. Here you will have a chance to relax, swim, and enjoy great food.